Suspect in killing shown in a common area of the mall. Source: Abu Dhabi police video from CCTV. BULLETIN: A 37-year-old American kindergarten teacher and mother of 11-year-old twins died in a hospital Monday after being stabbed in a Reem Island mall restroom in Abu Dhabi, the capital of the Abu Dhabi emirate in the United Arab Emirates. Whether investigators suspect Jihadist ties to the attack was not immediately clear. 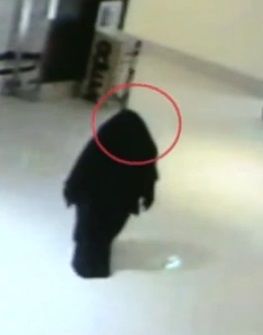 “Witnesses reported that the culprit was fully covered wearing an abaya, black gloves and face cover (Niqab),” Abu Dhabi police said in a statement. Police released a video showing the suspect in public areas. Video frames also show the attack area and an image of what might be the murder weapon. “The Abu Dhabi Police will spare no effort in order to unveil this heinous crime and bring the culprit to justice,” said Colonel Dr. Rashid Mohammad Borshid in a statement. Possible weapon used in Abu Dhabi restroom attack. Source: Abu Dhabi police video. It is always advisable to keep your security and situational awareness levels high. * Report concerns you may have to the U.S. Embassy in Abu Dhabi or the U.S. Consulate General in Dubai.